English in the modern secondary school is a broad and diverse subject that explores the many different ways in which we communicate. The English Department at Harrow Way is committed to the development of the various skills needed to study and create texts across a range of forms and genres. The Department leads students to academic success, sharing positive relationships with classes whilst maintaining high expectations and levels of behaviour. During Year 7 and 8, students are encouraged to develop their ability to express themselves through the reading of texts and by building creative and transactional writing skills. Speaking and listening skills are developed through discussion and presentation on an individual basis as well as in pairs and groups. Students will practise writing in a range of different forms, and there will be on ongoing focus on building skills of redrafting and editing. Active reading strategies are taught and wide reading is encouraged. Reading and study of The Graveyard Book and comparison with The Jungle Book. During both Year 7 and Year 8, students will compile a ‘Creative Portfolio’, which will consist of a range of creative writing pieces inspired by the various texts that they have studied. Throughout the year, students will refine, redraft and edit their creative work with a view to producing final pieces that showcase the very best of their creative skills. At GCSE level, we follow the WJEC GCSE English Language and English Literature Syllabuses. 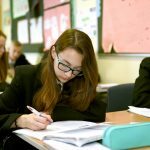 Students will sit their final GCSE exams in the summer term of Year 11: two English Language exams and two English Literature exams.